“The residents of Bondi love their Make-Up. Illamasqua is so very different to anything else around that they are thrilled by our colourful range and are excited that we give professional make up lessons.” – Daniel, International Trainer. The Art of Darkness collection and its mysterious themes and emphasis on the alter-ego are devilishly fitting as Halloween approaches, introducing new customers to the brands identity in true Illamasqua style. 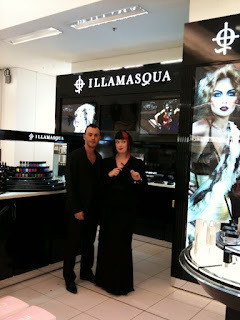 And finally, almost 2 years to the date since Illamasqua first launched, the final Australian counter is to open in Myer’s Brisbane City on 31st October. 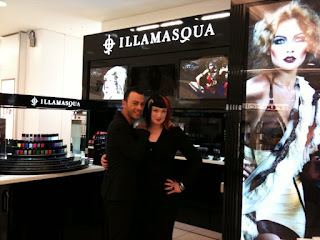 A Halloween launch has to be auspicious for Illamasqua! The best way to experience Illamasqua is to book in for a 45 minute professional Make-Up Lesson with one of our professional artists who will help you to create and define the perfect look for you – no one else – you. The lesson is recorded on a CD for you to take home and use to practice with – a fabulously useful tool. Make-Up lessons are $70 which is fully redeemable against Illamasqua purchases on the day. To make an appointment at any of our counters call 1800 661 210.